“Microsoft Monday” takes a look back at the past week of news related to Microsoft. This week, “Microsoft Monday” includes details about the Windows 10 upgrade becoming automatic, the Windows 10 Preview Build 106576, Xbox One backwards compatibility, ‘Minecraft: Story Mode Episode 2 – Assembly Required,’ the benefit of the Halo 5 “T” Rating, a Halo 6 rumor, the Xbox One Kinect Bundle price drop, an issue with the Surface Book flickering, the Skype iOS app update, the integration of the Sunrise app into Outlook and more. Did you know that Microsoft MSFT +1.89% automatically downloads Windows 10 on every Windows 7 and Windows 8 PC? And earlier this month, an “accident” caused Windows 10 to install without user authorization. But now it appears that Microsoft will be pushing for mass Windows 10 upgrades on the older versions of Windows. Windows and Devices Group executive vice president Terry Myerson wrote a blog post saying Windows 10 installations will now be a two step process. Windows 10 has been reclassified as an “Optional Update,” meaning users that have Windows set up to accept all updates will notice that the new operating system installs automatically. To cancel the upgrade, users will have to make sure to cancel it manually. “In an effort to streamline the process, we will automatically kick off the upgrade process once you have made a reservation. Before the upgrade changes the OS of your device, you will be clearly prompted to choose whether or not to continue. 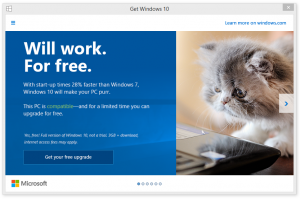 And of course, if you choose to upgrade, then you will have 31 days to roll back to your previous Windows version if you don’t love it,” wrote Myerson. In the next few months, Microsoft will make Windows 10 a “Recommended update.” This means that the upgrade process will automatically initiate on your device depending on your Windows Update settings. You will be prompted to choose whether or not to continue and you will have 31 days to roll back to the previous Windows version also. Even pirated copies of Windows 7 and Windows 8 can be upgraded to Windows 10. And Microsoft will offer a “one-click opportunity to get Genuine via the Windows Store or by entering an activation code purchased elsewhere.” Depending on how well this experiment goes, Microsoft will expand upon it. In an interview with PCWorld, Microsoft’s Corporate Vice President of the Operating Systems Group Joe Belfiore acknowledged that Windows 10 tracks how it operates and what the user is doing. Details are also sent back to Microsoft by default. And the core data collection cannot be stopped even if you switch off some of the tracking elements, according to Forbes contributor Gordon Kelly. Why does Windows 10 collect data? If serious problems arise in the system, the data collection makes it easier to pinpoint where the issue is occurring and how to fix it. I believe it is admirable that Belfiore acknowledged the data collection aspect of Windows 10. There are many other companies that are not as transparent and forthcoming about the data it collects. If you are interested in tweaking your privacy settings on Windows 10, you can go to Start Menu > Settings > Privacy. Last week, Microsoft released two Windows 10 preview builds for Windows Insiders — one for desktops and one for mobile devices. Windows 10 Preview Build 106576 has several new features, bug fixes and minor improvements. One of the most notable changes is a Media Casting feature in the Microsoft Edge web browser. Windows Insiders will be able to cast video, photo and audio content to Miracast and DLNA compatible devices that are connected to their home networks. However, content from Hulu and Netflix is not yet supported in the Media Casting feature. The new preview build also includes a Cortana feature that was not available before. Now when you highlight text in a PDF within Microsoft Edge, you will be able to right click and select “Ask Cortana” to find more information about that content. And there is a new voiceover recording feature that has been added to the Xbox beta application for Windows 10 — which can be found in the Game DVR. An issue that caused the Xbox app for Windows 10 to consume several gigabytes of memory on a PC when a game is being played has been fixed. Windows Insiders will be able to download the preview build from the Fast ring. During the Halo 5: Guardians streaming event last week, the Xbox Live Director of Programming Larry “Major Nelson” Hryb confirmed that the Xbox One console will start supporting backwards compatibility starting November 12th. The update is known as the “New Xbox One Experience.” Essentially, the console will be updated to Windows 10 on that date. Backwards compatibility will be supported on over 100 Xbox 360 titles this fall and hundreds more will be followed in the months to come. Most of the games that will be supported initially are published by Microsoft, but the Redmond giant said that games made by third party companies will follow shortly after. When the Xbox One is updated to Windows 10, Cortana will be added to the console as well. You will be able to speak commands to Cortana such as Internet search queries and find out whether a friend is online. However, Cortana will rely on the Kinect to work. By offering backwards compatibility, Microsoft is expecting tens of millions of people to buy an Xbox One. Those potential customers are most likely existing Xbox 360 owners that held off because they still want to play games on the older console. Aaron Greenberg, a senior director of the Xbox marketing team, was recently interviewed by GameSpot where he said that Halo 5 having a “teen” rating could help improve sales. “Being able to have a T-rated game will sort of put this game on the ‘approved’ list for a broader audience,” said Greenberg in the interview. Halo 5 received the T-for-Teen rating from the ESRB instead of M-for-Mature. Greenberg said that he was surprised about previous Halo games receiving an M rating, but he is happy with the T rating because a broader and younger audience will be able to access it. Halo 5 officially launched on October 27th and it has received solid reviews across the board. It received 9/10 from Forbes contributor Erik Kain, 8/10 from GameSpot, 4.5/5 from Metacritic and 4/5 on GamesRadar. Aside from Halo 5: Guardians, Rise of the Tomb Raider is also exclusive to the Microsoft Xbox One. Both Rise of the Tomb Raider and Fallout 4 will be launching on November 10th. But Greenberg believes that both of those games will be successful on that date. In an interview with Kinda Funny Games (video below), Greenberg said that the challenge is that you have “to look at the production schedule.” If Rise of the Tomb Raider was released two weeks earlier, then it would be at the same time as Halo 5: Guardians. And one week earlier would be against Call of Duty: Black Ops 3. One week later than the release date would put it against Star Wars: Battlefront. “We felt like the Fallout audience and game, while both fantastic games, they’re not direct competitors per se,” said Greenberg during the interview via TechTimes.